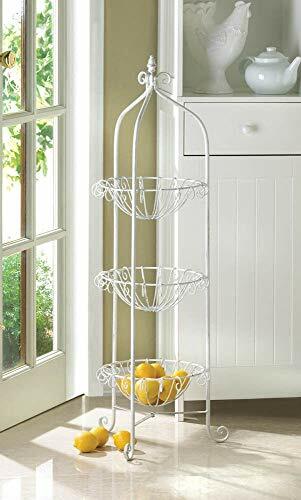 This corner basket stand is proof that romantic and charming room additions can be functional*Dimensions: 14" x " x "*Material(s): metal*Each basket is approximately 10 1/4" x 3 5/8" high This corner basket stand is proof that romantic and charming room additions can be functional. Three curled metal wire baskets stand in a metal frame, complete with curled feet and a finial on top. Fill it with three of your favorite plants or blooms or let your imagination fill these baskets with whatever you'd like to display. Each basket is approximately : 10 1/4" x 3 5/8" high. 14" x " x "
Fill it with three of your favorite plants or blooms or let your imagination fill these baskets with whatever you'd like to display. View More In Hanging Baskets. If you have any questions about this product by Kitchen Decor, contact us by completing and submitting the form below. If you are looking for a specif part number, please include it with your message. CVHOMEDECO. Oval Metal Wire Egg Basket Wire Basket with Wooden Handle Country Vintage Style Storage Basket. Rusty, 12-3/4 L X 9" W X 3-1/2 H.
Hosal Gold Hanging Basket for Wire Wall Grid Panel, Multifunction Wall Storage Display Decorative Basket, Size 14.6"x5.1"x3.9"
Rose Gold Straight Shelf Rack for Gridwall Grid Panel Wall Mountable Wire Organizer Storage Flower Pot Display Decor 9.8" x 3.9"